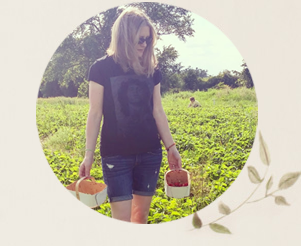 On Sunday, I shared my vegetarian menu plan for this week. (Well, it's vegan for me and vegetarian for the other three family members.) Today, on What I Ate Wednesday, I'm looking at a few meals I consumed in the past week, before my menu plan kicked in. Visit me Sunday to hear whether my plan was a success. I'll share any of the recipes that work out. As I noted then, my goal for the new year is to increase my family's fruit and veggie consumption every day. 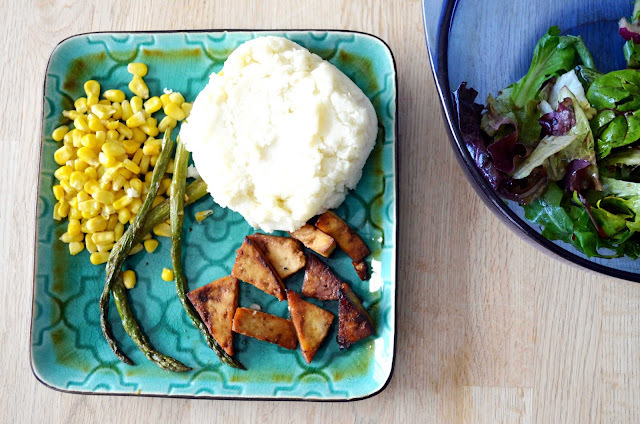 One of the strategies I'm using is to buy more frozen vegetables for quick, easy meals. I bought a mix of already-grilled frozen peppers, potatoes, zucchini and onions. For lunch one day (pictured above) I sautéed some of the mix in olive oil and then put it on a bun. I popped it in the panini press and then added some vegan mayonnaise. I found the combination of the roasted potatoes with a bun outstanding. I kept going on about it to anyone who would listen (nobody did). I also bought a frozen rice and vegetable mix. I fried some of that up too, adding some larger frozen veggies as well. After it was good and hot, I added Bragg's Liquid Aminos for flavour. I'm trying to serve salad with almost every dinner too. One day I had a salad lunch. I'm not a salad-for-lunch fan, but it was late in the day and I didn't want to spoil my dinner. 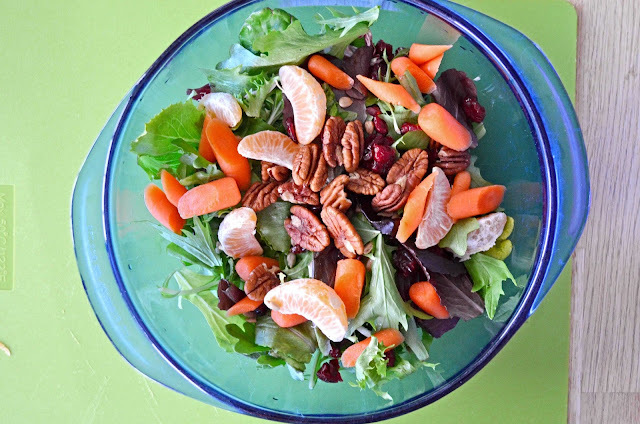 I added carrots, pecans, dried cranberries and clementines to mixed greens. I generally top salads with olive oil, vinegar and salt, like my Italian mother-in-law. 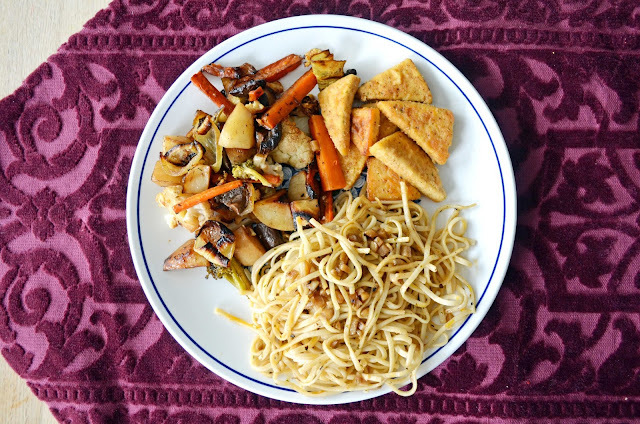 One night I roasted a bunch of veggies and we ate them for dinner alongside kamut udon noodles and tomato sauce. 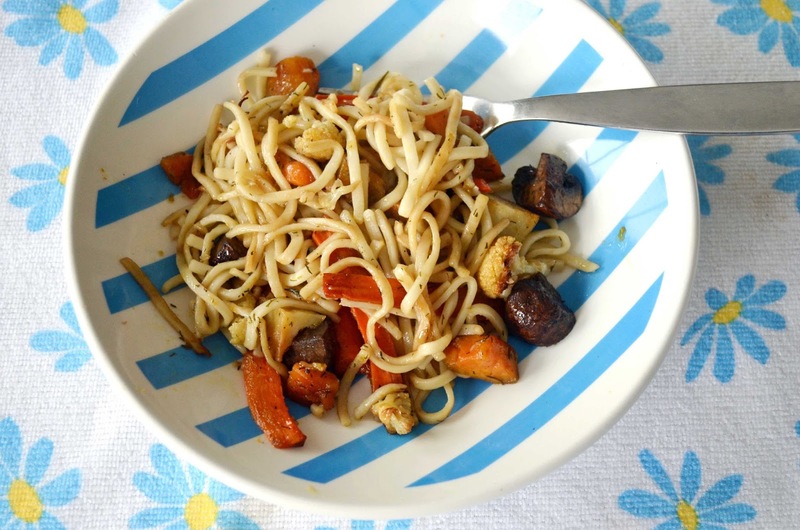 The next day I sautéed leftover noodles and roasted veggies in olive oil and used my trusty Bragg's to flavour it. It was delicious! I had more leftovers for lunch another day. Do you think I had enough mashed potatoes? My husband put them on my plate (still in the shape of the storage container) and I was too lazy to put some back. I ate them with corn, baked tofu, asparagus and salad. I was stuffed. My husband made this dinner on Sunday. More roasted veggies, breaded tofu and one of my favourites - garlic noodles. See all the bits of garlic? Yum. 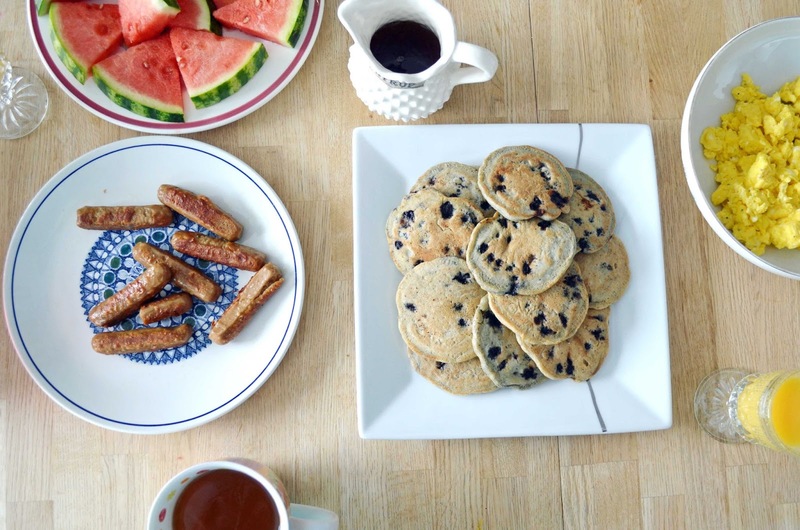 On Sunday morning, I made the kids a celebratory (not so much) back-to-school-tomorrow breakfast of blueberry flax pancakes, Yves veggie sausage, watermelon and scrambled eggs. I tried to numb their pain. 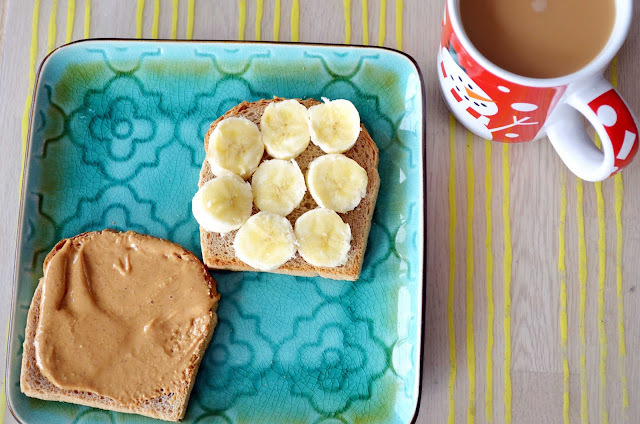 On Monday, my by-myself-again breakfast was much simpler, but inspired by one of my son's favourites - peanut butter and banana slices on toast. How about you? Any plans for changing your food intake this new year? Everything looks delicious. The garlic noodles has my mouth watering. You do a lot with tofu which is very inspiring for me. Yum!! We are just trying to be more aware of what we are eating, if that makes any sense-- balanced & whatnot. I always find your menus so inspiring!! That makes perfect sense Tabetha! All of your pictures look really good. I am a huge noodle fan! Although I am not vegan, I am trying to eat healthier. My husband and I eat out a lot and that is our new years resolution. To not eat out at restaurants or fast food places. I've done a really good job of that so far. We haven't eaten out at all. I'm saving a lot of money and I love all the leftovers. My excuse for not cooking was that I just don't have the time, but cooking up some frozen veggies and noodles takes less time than getting in the truck and driving somewhere to be served. I love my New Years resolution! Posts like yours inspire me to continue on. It's so tempting to eat out at restaurants, but it sure gets expensive. And, it's hard to find healthy options. I'm glad you are doing well with your goals! I'm happy if I have helped in any small way. Dang. I'm trying to not eat so much pasta/noodles and your pictures are making me CRAVE them. Dang. Sorry Ruthie! I just love pasta so much. I don't think I could give it up. I am so hungry right now and this all making my mouth water. Literally. ! I'm trying to do salad at every meal, too. Yours looks delicious with the mix of fruits, greens and nuts! I am really trying to keep up the salad thing. I went back to the store yesterday and bought romaine this time. Those mixed greens seem to rot so quickly. Mmmm..garlic noodles. I am also making more of an effort to eat more fruits and veggies. I've been making myself smoothies in the morning, something I can make and take with me. 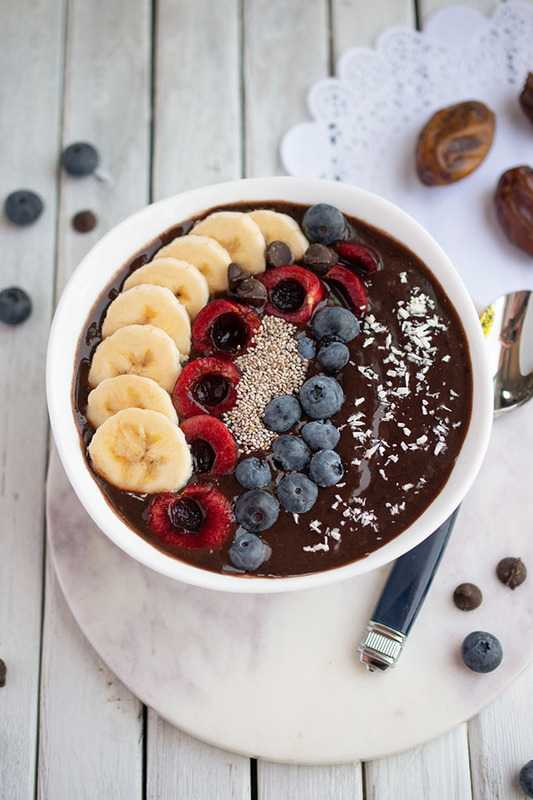 Do you have any good smoothie recipes to share? Wow, everything looks so delicious! Your pictures are beautiful. Do you have the recipe for those pancakes anywhere? They look wonderful! Happy WIAW! 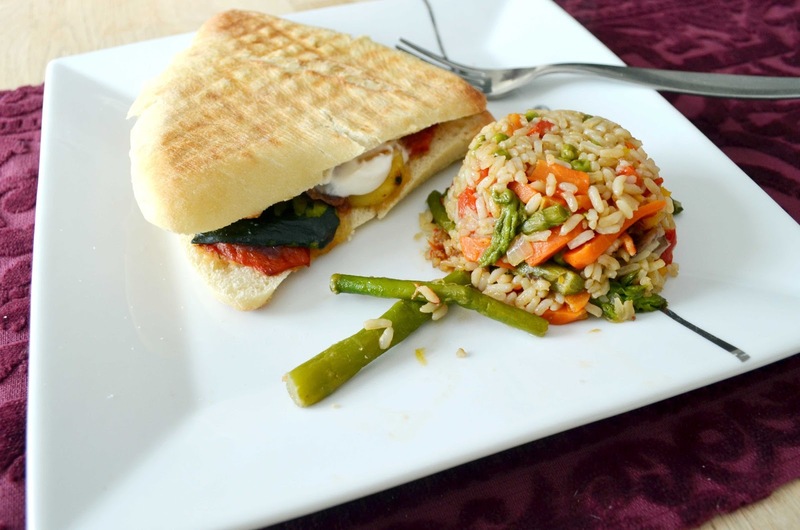 Looks like your veggie challenge is off to a great start! I've been buying more frozen veggies lately, too. Especially greens like kale or swiss chard, saves so much time washing and chopping! That's a great idea. I hate washing kale! Me too, i was thinking about it, to use frozen vegetables, it will be easier to prepare them when we arrive too late at home. All your recipes give me envy to try them! It all looks good, and I love Yves veggie sausage but everyone around here stopped carrying them a couple years ago. I'm very jealous! We had trouble finding the sausage for a bit, but now everyone has them again. Do you have any of the Yves stuff? Your food pics always give me good ideas! We're a veggie family too, and I need to increase our fruit and veggie intake too. OMG! Your food looks like art to me! I think I would feed just by looking at it! I don't have it regularly, but I enjoyed it! You have the best lighting!